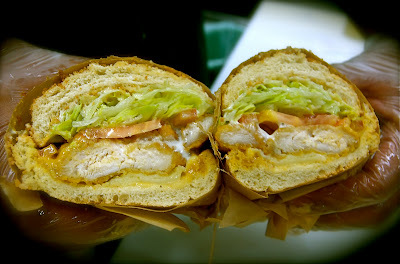 If you follow me on twitter, you are well aware of my affinity for one certain sandwich shop in San Francisco. Not only is Ike's Place my favorite place to get a tasty (and filling) sandwich, but Ike has made a lifelong fan and customer out of this girl by giving me my very own sandwich. Yup, I have a sandwich. Named after me. How cool is that?!? The day the "Jaymee Sirewich" debuted was one of those days where you say to yourself "Wow, my life is pretty awesome." When people hear I have a sandwich named after me, a lot of them try to guess what I picked for my ingredients. One co-worker said: "Let me guess: turkey, avocado, sprouts, and cucumbers." Ha...the Jaymee Sirewich couldn't be more opposite. While I also enjoy turkey and avocado, I wanted to go for something with a little more "Wow" factor. I told Ike that I love wing sauce, but they already have the Hot Momma Huda...which has chicken, Frank's RedHot, Ranch, and Provolone. So I actually went in for a "tasting" and we sampled about six different combinations. One of them included a yellow BBQ/wing sauce, which is a mustard-based sauce. I loved the tangy and slightly spicy take on one of my favorites, so I was sold. 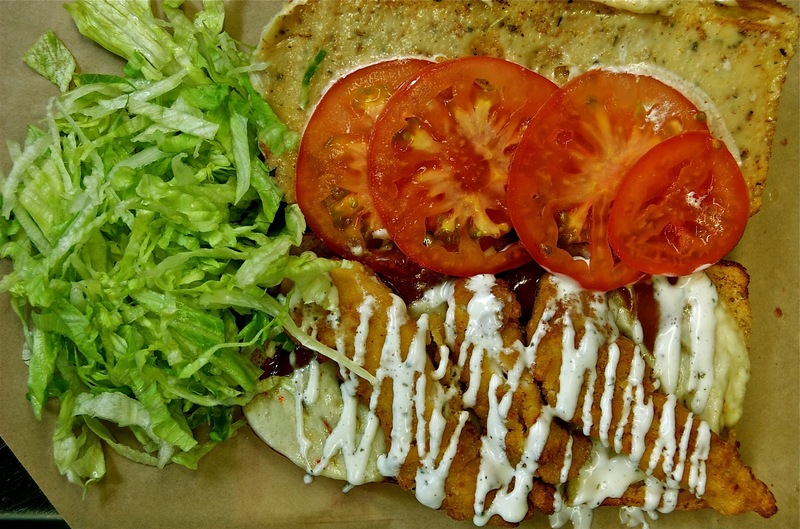 I'm also a fan of Ike's halal chicken, but the FRIED chicken option was just too good to pass up. Add Ike's famous dirty sauce, ranch dressing, and some pepper jack cheese...and you've got yourself a Jaymee Sirewich. I opt for no tomatoes, and add pepperoncinis and sometimes jalapenos for extra kick (on Dutch Crunch of course). And I would be remiss here if I didn't thank my friend and co-worker Adam Littlefield for getting the ball rolling on this thing. So thanks Adam! 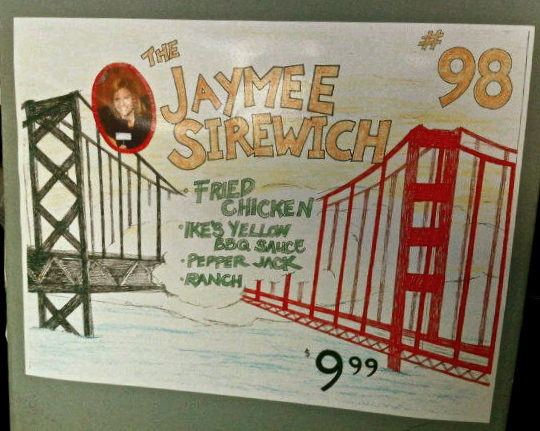 In the meantime, if you haven't been, get down to Ike's and check out the Jaymee Sirewich. (You can also sub vegan breaded chicken if you're not a meat eater or gluten free bread if you can't have wheat). And to see some of the other sports-themed sandwiches, check out the open to our SportsNet Central show on National Sandwich Day a few weeks back. [UPDATE 12/3] I couldn't resist adding a photo of my other co-worker (Matt Maiocco, left). I owed him lunch, and he chose Ike's as the place to settle up this week. This was his very first experience trying Ike's. Naturally, he decided to get the Jaymee Sirewich. Just look at the sheer joy and excitement on his face. Folks, it really is THAT good. Hi Monts!!! I just stumbled upon your blog & I LOVE IT!! You & I share a love for buffalo wing sauce & your recipes are right in my wheel house...totally going to try to buffalo dip this weekend for MSU's playoff game--Go Cats! :) Hope you are doing well friend! Thanks Ali!! Hope all is well...your family is beautiful! I love this sandwich, thanks so much for developing it! nice work that sandwhich looks delicous!